ONE LESS GUN: At about 3:03am, on Friday, October 19, 2018, officers from District B-2 (Roxbury) responded to a call for shots fired in the area of 42 Brook Avenue in Roxbury. On arrival, officers located ballistic evidence in the immediate area. While still on scene, officers learned that the person seen firing the shots may have entered a home in the area. While directing their flashlights on the house at 42 Brook Ave, officers observed an individual on the second floor duck down in an attempt to conceal himself. A search of the dwelling enabled officers to locate an individual hiding under a bed on the second floor. While talking to the suspect, officers quickly ascertained that the individual did not live at the address. A more extensive search of the location with help from a BPD K-9 Officer and his partner, Rocky, enabled officers to discover and recover a firearm (see photo) and empty magazine found in a bedroom closet. Officers arrested Carlos Barros, 32, of Boston and charged him with the Unlawful Possession of a Firearm, Unlawful Possession of Ammunition, Carrying a Loaded Firearm on a Public Way and Discharging a Firearm within 500 Feet of a Dwelling. 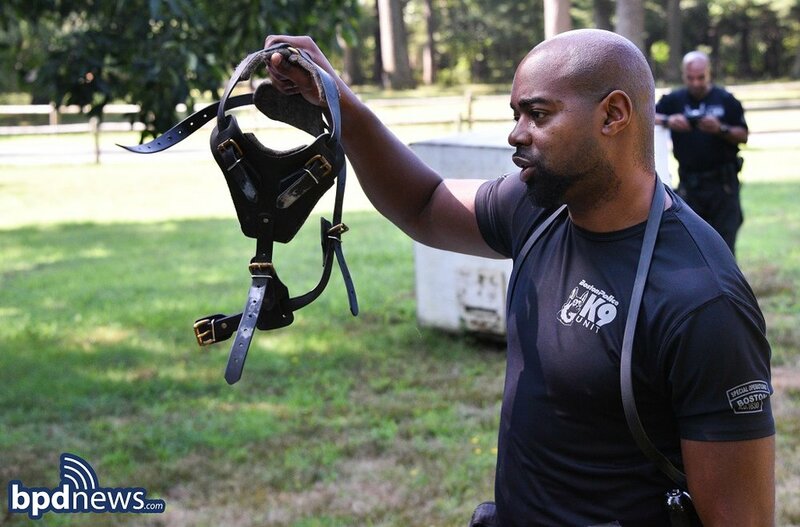 BPD in The Community: Kids from Junior Police Academy Get a Behind-the-Scenes Tour of the BPD's K-9 Unit: Friday, August 10, 2018, Junior Police Academy campers from District C-11 (Dorchester) and District B-3 (Mattapan), while accompanied by Boston Police Officers, had a wonderful time during a behind-the-scenes tour of the BPD’s K-9 Unit. As you can see by the photos, kids had a great time interacting with and talking to the officers assigned to the unit while learning about their fury four-legged partners and their training methods. Special thanks to the officers for sharing their time with the kids. It’s always great to see the kids from the Junior Police Academy conversing and connecting with our officers in an informal, friendly, welcoming setting. Together we make our city safer. Men and Women of the BPD Salute K-9 Koda on his Retirement: This past week the Boston Police Department lost a valued member of its crime-fighting community as BPD K-9 Koda called it a career, working his final tour of duty on April 12, 2018, after eight years of faithfully protecting and serving the citizens of Boston. Said his handler, “Without a doubt, it was an absolute honor and privilege to partner with Koda. As any K-9 officer will tell you, the relationship and bond between a K-9 officer and his dog is as strong and special as they come. To say I’m gonna miss him is an absolute understatement. He knew how to protect and serve. He always had my back. And, as much as I hate to see him go, there’s no doubt his retirement is definitely well-earned and well deserved.” It should also be noted that on his final tour of duty, Koda, a narcotics dog by trade, assisted members of the District E-5 Neighborhood Drug Control Unit during the execution of a search warrant in West Roxbury which led to the recovery of a substantial amount of illegal drugs. Said his handler, “That’s classic Koda. Working hard right up until the very end. Treating his last day like it was his first.” From all of us here at the Boston Police Department, we salute our furry four-legged friend and colleague and wish him well in retirement. About 9:55AM, on Sunday, April 15, 2018, officers from District D-4 (South End) responded to a call for a breaking and entering in progress in the area of 400 Boylston Street. While en route to the call, officers learned that the suspect (described as a white male in his thirties, wearing a black winter hat, red bandana, tan sweatshirt and blue jeans) was seen trying to force his entry into an apartment in the rear of 410 Boylston Street. On arrival, promptly observed an individual, who fit the description of the suspect, climbing onto the fire escape of 400 Boylston Street and entering the building through a 2nd floor window. At this time, officers requested the assistance of a BPD K-9 handler and his dog in order to conduct a search of the building for the suspect. On arrival, the officer and his trusty K-9 partner, Vader, entered the building and, in due time, were able to locate the suspect hiding inside a crawl space under a 1st floor stairwell. When the suspect refused to surrender himself and exit the building, Vader was sent in to influence him to do otherwise. In short time, the suspect was taken into custody. Officers arrested Sam Hess, 28, of Boston and charged him with Breaking and Entering, Resisting Arrest and Trespassing. Happy Opening Day from the Boston Police Department! Today, April 5, 2018, before the Boston Red Sox took to the field at Fenway Park and fans filled the stands, members of the Boston Police Special Operations Unit and K-9 Unit were hard at work making sure the ballpark and the surrounding areas were safe. Mayor Walsh, BPD Commissioner Evans, and BPD Superintendent-in-Chief Gross were on hand during the Opening Ceremony for additional luck. To the Fenway Faithful: Enjoy the game, celebrate responsibly, and get home safely! Go Sox! At about 9:47 PM on Tuesday February 27, 2018, an officer assigned to District E-18 (Hyde Park) was flagged down while on patrol in the area of Fairmount Avenue and Truman Parkway by a victim who stated that he had just been carjacked at gunpoint. The victim stated that he had been forced out of his vehicle by three male suspects in the area of 577 River Street and that one of the males had brandished a firearm during the incident. The officer searched the area and quickly located the stolen vehicle parked and occupied in an alley behind 771 Truman Parkway. Upon seeing the officer approaching, the three suspects simultaneously exited the vehicle and fled on foot through nearby backyards. The officer pursued one of the suspects on foot, later identified as Joquentz Constant, 21, of Dorchester, and placed him in custody in the area of 11 Williams Avenue with the assistance of additional responding units. Officers then set a perimeter while BPD K-9 Duke arrived on scene and began to search for the two remaining suspects. Duke soon located, Marckenley Casimir, 27, of Mattapan and Hermano Joseph, 27, of Randolph, hiding on a deck in the rear of 755 Truman Parkway at which time they were placed in custody without further incident. It was later determined that Casimir was wanted on two outstanding warrants sought out of Suffolk Superior Court for Armed Assault to Rob and Assault with a Dangerous Weapon. During their continued search efforts, officers recovered property belonging to the victim as well as a replica firearm and other evidence related to the investigation in the area of 767 Truman Parkway. All three suspects will appear in West Roxbury District Court on numerous charges including Carjacking, Armed Robbery and Kidnapping. At about 5:00 AM on Saturday, December 29, 2017, officers assigned to District C-11 (Dorchester) responded to a call for a commercial alarm at the Pleasant View Market located at 1 Savin Hill Avenue in Dorchester. When the first officer arrived on scene, he observed an individual standing near a shattered window in front of the store. The officer noticed that there was a large amount of glass on the ground mixed with loose coins. When the officer went to speak with the man, he immediately took off running towards Dorchester Avenue. The officer pursued the suspect but lost sight of him near 29 Savin Hill Avenue at which time additional units began to set a perimeter in the immediate area while a BPD K-9 Unit responded. BPD K-9 ‘Duke’ quickly arrived on scene with his handler and began to canvass the area. Duke soon located the suspect hiding underneath a delivery van parked in the rear of 1111 Dorchester Avenue. The suspect, identified as Willie Jenkins, 50, of Boston, was then placed in custody without further incident and transported back to the station. Officers recovered an unopened pack of cigarettes and an unscratched Mass Lottery scratch ticket underneath the van along with other evidence connected to the incident. During the booking process, officers seized seven additional packs of cigarettes, two more scratch tickets and nearly fifty dollars in loose change with shattered glass mixed in with it. Jenkins will appear in Dorchester District Court on numerous charges including Breaking and Entering, Larceny and Destruction of Property. At about 10:15 AM, on Monday, December 18, 2017, officers assigned to District D-4 (South End) and members of the BPD K-9 Unit made an on-site arrest after responding to a call for a residential breaking and entering in progress in the area of 418 Columbus Avenue in the South End. While on approach, officers were provided with a suspect description and informed that the male suspect had been observed in the rear alley behind the building throwing large rocks at a rear glass door. On arrival, officers were directed down the alley to the rear glass door which they observed to be completely shattered with the suspect nowhere in sight. Believing he suspect to still be in the building, additional responding officers set a perimeter around the building and awaited the arrival of a BPD K-9 to conduct a building search. In short time, two BPD K-9 officers quickly arrived on scene at which time, K-9 Vader (see photo) was let off his leash and entered the building. The K-9 Officers and Vader soon located the male suspect, later identified as Deshawn Wesley, 26, of Boston, hiding in an upstairs bedroom at which time he was placed in custody without incident. Officers then searched the suspect’s backpack, at which time they recovered two unopened Christmas presents along with assorted jewelry and other personal items. The resident of the home later returned to the scene and identified the property which was then returned to her. The suspect will appear in Boston Municipal Court on a charge of Breaking and Entering. Said Police Commissioner William Evans: "Whether they walk on two feet or four, I continue to marvel at the hard work being done by all of my officers in their never-ending efforts to keep our city safe. And, I’m especially proud of Officer Miller and his K-9 partner, Vader, for the quick response and apprehension of one individual who clearly missed the memo about the importance of being good for goodness sake especially so close to Christmas." Remember Viggo? He's growing up fast! Boston Police Department K-9 Viggo is all grown up and was recently photographed for the May/June edition of Working Dog Magazine with BPD head trainer, Officer Troy Caisey. We first introduced you to Viggo two years ago when he was a puppy in need of a name and, with the help of the community's hundreds of entries, Officer Caisey chose the valiant name Viggo. Since then, Viggo has trained diligently for the BPD as a dual purpose Explosive Ordinance Detection and Patrol K-9. He was most recently certified by the BPD for bomb and firearm detection, as well as earning ATF certification for explosive detection. Viggo was also at the Boston Marathon finish line this year, keeping spectators and runners safe before and during the race. When he turns two years old this June, he will go for his National Patrol Dog certification with handler Caisey at the helm. Keep up the great work, Viggo, and stay safe! Daily Dose of Great Police Work: Who Needs an Elevator When You Can Take 30 Flights of Stairs??? Boston Police Special Operations Welcomes Boy Scouts of America Troop 48! Today, Thursday, April 20, 2017, the BPD K-9 Unit, BPD Bomb Squad, and BPD SWAT welcomed Boy Scout Troop 48 from Rochester, New York for a demonstration. The young men from Troop 48 are visiting the area to learn more about the great City of Boston and its history, so naturally, they stopped by to see the First in the Nation, Boston’s Finest! The scouts were able to explore the SWAT Unit’s “bear cat” armored truck, try on the Bomb Squad’s equipment and control their cameras, and marvel at K-9 Loki’s agility and obedience. They even met the K-9 Unit's newest (and littlest) member--who has yet to be named! Keeping Boston Safe: BPD Secures America’s Oldest Ball Park on Opening Day and Every Game Day so the Red Sox Can Play Ball! 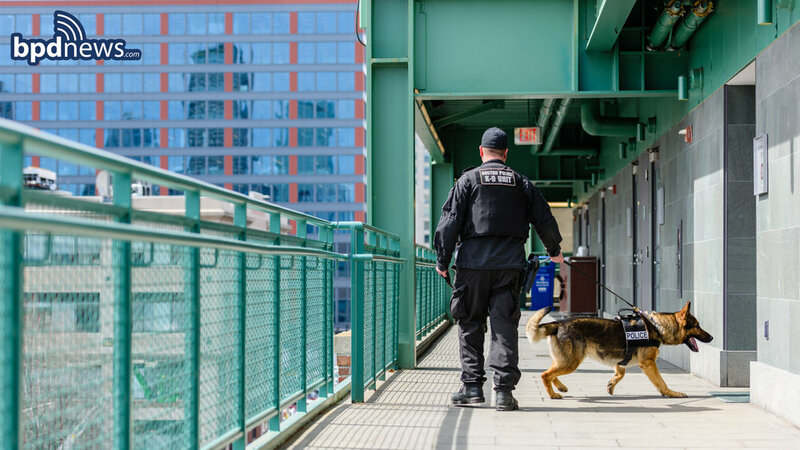 On Monday, April 3, 2017, as thousands of Boston Red Sox fans flocked to Fenway Park for Opening Day, officers assigned to the BPD K-9 Unit were hard at work in and around the old ballpark to make sure everyone would be able to enjoy the day in safety. Commissioner Evans was on hand to meet and greet the public as they made their way through the turnstiles and Chief Gross was out on the field for the opening ceremonies saluting proudly during our National Anthem. BPD Officers will be at the park for every home game throughout the 2017 season to ensure the safety of the ball players and all the loyal fans of Red Sox Nation. Let's go Sox! 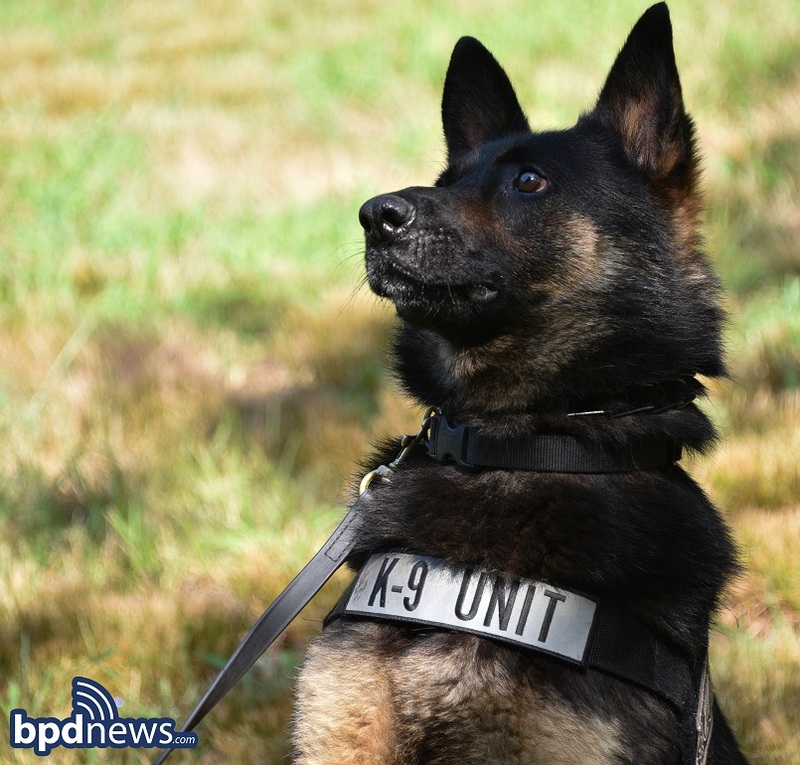 The Boston Police Department is saddened to announce the passing of active duty K9 Bronson. K9 Bronson was the first dual purpose Patrol and Explosive Detection K9 in the Boston Police Department's K9 Unit. His success and example has since led to the addition of 12 more dual purpose dogs to the unit over the past 6 years. Bronson passed away at home with his partner and head trainer of the K9 Unit, Officer Troy Caisey who stated, “On Sunday, January 15, 2017, I lost my K9 Partner of 8 years. Boston Police K9 Bronson passed away at home after a sudden illness. I raised him as a puppy from 12 weeks old and he was by my side until he passed away at the age of 9. Bronson was what I love to see in a Police Dog - high energy level, always ready to work, confident, good temperament and a bit of a punk. He rode along side of me for countless shifts patrolling the City of Boston and I always knew that he was ready for anything we encountered. On what would end up being our final night together, when I knew he was slipping away and he wouldn't last much longer, I spent time with him sitting in my yard with his head in my lap - just talking to him. I can't possibly explain all that he meant to me or how much he will be missed. So as you go about your busy day and your dog is staring at you for a little attention or play time - take a few minutes for them. All they want to do is please you and spend a little time with you. They won’t be here for long.” Rest in peace Bronson. 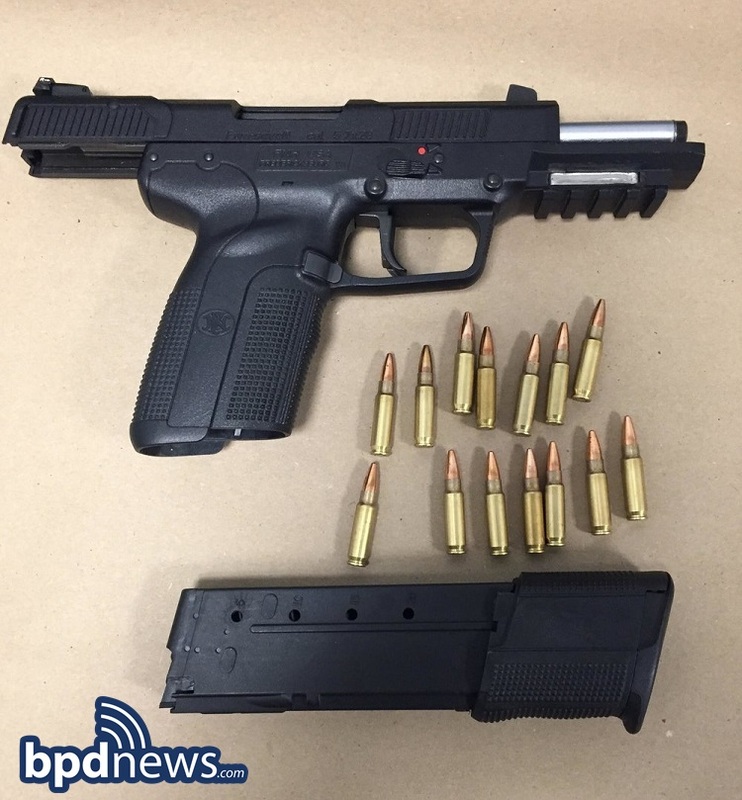 At about 1:43 AM on Saturday September 24, 2016, officers assigned to District B-3 (Mattapan) made an onsite firearm arrest after shots were fired in the area of Eerie and Ellington Streets in Dorchester. The officers were on patrol when they heard the sound of gunfire within close range and then observed a male walking quickly from the area while clutching at his waistband, leading officers to believe he was in possession of a weapon. Upon seeing the officers, the suspect, later identified as Anthony Tabb, 23, of Brockton, immediately took off running. The officers chased the suspect for several blocks and called for additional units after the suspect entered a private backyard at 11 Fowler Street and could not be located. The suspect was found hiding underneath a ladder by BPD K-9 Duke (pictured above left) and placed in custody. BPD K-9 Boomer (pictured above right) then retraced the suspect's path of flight and located a loaded .40 caliber Smith & Wesson SD40 VE handgun. The firearm has been turned over to the BPD Ballistics Unit for processing. The suspect will appear in Dorchester District Court on charges of Trespassing and Resisting Arrest, although, additional weapons charges could be added at a later time pending the outcome of the investigation. 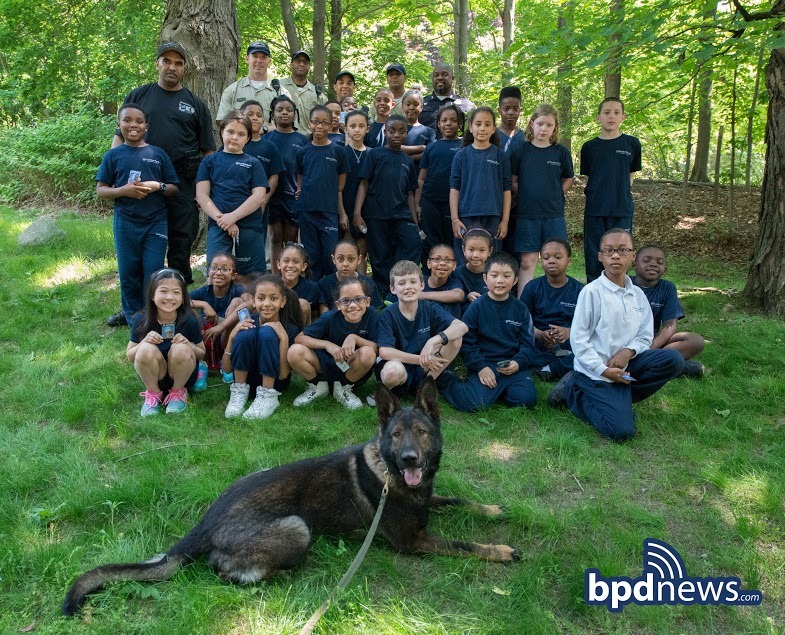 On Friday, July 15, 2016, the kids from Districts C-11 (Dorchester) and A-7 (East Boston) participating in the Boston Police Activities/Athletics League (PAL) Junior Police Academy were treated to a day with the BPD K9 Unit. Officers Gillis and Paterson and their K9 partners Betty (black lab) and Loki (Belgian Malinois) demonstrated their police skills for the junior recruits and showed them just how fun the “dog days of summer” can be! BPD Photo of the Day: Cops and K-9s and Kids…Oh, My!! On Friday, May 27, 2016, to kick off Memorial Day Weekend, students from Saint John Paul II Academy in Boston took an educational trip to the BPD K-9 Unit base and training facility. The kids learned about all the different jobs police dogs do, about different dog breeds, and about how the police officers train their dogs. K-9 Officer Cornell Paterson gave the students a pop quiz before a pizza lunch. Those who were able to answer the questions quickest were rewarded with a K-9 trading card—but by the end of the day, ALL the kids managed to win a card!